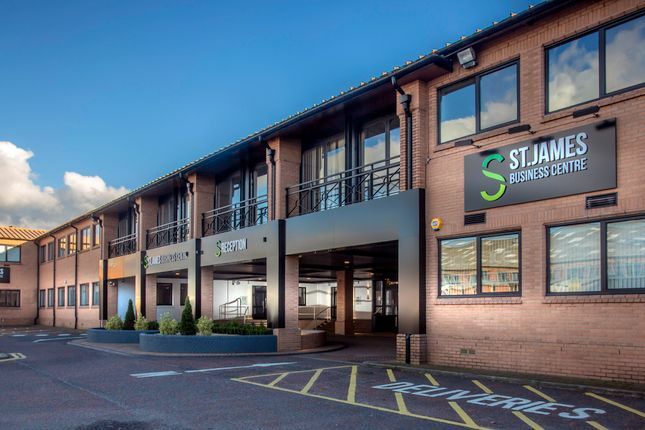 St James Business Centre is a 3 storey office building with a range of office sizes to cater for businesses of any size or type. The building has many strengths, but one of its key attributes is the ability to offer both conventional and fully serviced office solutions on flexible terms at competitive rental rates. Located on the outskirts of Warrington town centre, St James Business Centre is perfectly situated for all forms of transportation and has extensive onsite parking. The building also greatly benefits from spacious internal courtyards, an onsite café and childern's nursery. The business centre is within a 10 minute walking distance from both Warrington Central and Bank Quay rail stations, and has fantastic local amenities right on its doorstep – Riverside Retail Park and Golden Square Shopping Centre to name a few. Property descriptions and related information displayed on this page, with the exclusion of Running Costs data, are marketing materials provided by Langtree, and do not constitute property particulars. Please contact Langtree for full details and further information. The Running Costs data displayed on this page are provided by PrimeLocation to give an indication of potential running costs based on various data sources. PrimeLocation does not warrant or accept any responsibility for the accuracy or completeness of the property descriptions, related information or Running Costs data provided here.